• An estimated 100 million sharks are killed every year, with fins from up to 73 million used for shark fin soup. • Some shark populations have declined by up to 98% over the past 15 years. • Nearly one-third of open-ocean shark species are considered threatened, according to the International Union for Conservation of Nature. • As apex predators, sharks are vital to maintaining the balance of marine ecosystems. These animals should be celebrated, not slaughtered. What is WildAid doing to end the shark fin trade? To measurably raise awareness and concern about the impact of the consumption of shark fin soup on shark populations and marine biodiversity, WildAid works with media network partners in China to broadcast our campaign messages via TV and other media outlets, including video billboards in subway and train stations, airports, and university campuses. We have produced many high-quality TV PSAs on shark fin for China with our celebrity ambassadors Yao Ming and others, including prominent Chinese CEOs. WildAid's latest campaign features several PSAs including sports icon David Beckham, actor/director Jiang Wen and actress Maggie Q. The good news: Consumer eduaction works. Our campaigns, in combination with government bans at official events, have contributed to a reported 50%-70% decrease in China’s shark fin consumption. 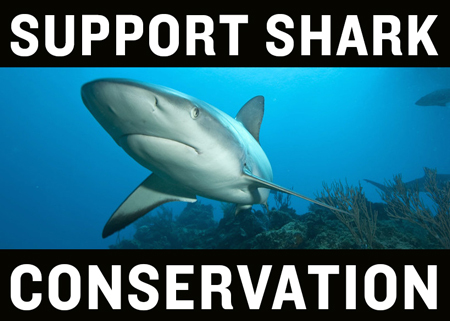 What can you do to help save sharks? • First and foremost, do not buy food containing shark fin. • Tell your friends and relatives that they may be contributing to the irreversible decline of shark populations. • Always opt for environmental and sustainable alternatives and substitutes. • Contact your elected officials asking them what steps they are taking to end the unregulated trade in shark fins. • Sign our shark pledge, vowing to lend your voice to the 73 million sharks whose fins are used in shark fin soup every year. • Give to WildAid's shark program, which works internationally to save these magnificent species. • Yao Ming asks: If you could see how shark fin soup was made, could you still eat it?